Failure To Act: The Titanic and the Ice Warnings. The ice warnings received by the Titanic were obviously a vital resource in the safe navigation of the White Star Line vessel. But a lot of disinformation has been written about them over the course of more than 100 years and the object of this essay is to dispell the false statements using the words of the people at the time, and the data presented at the inquiries and hearings. All too often, people repeat the basic information, such as "the warnings were ignored" but this is not quite true. Naturally, any analysis relies on a lot of discussion and dissemination of exactly what was said and when. An unfortunate side effect of this is that the contradictions soon become apparent although such discourse is necessarily somewhat repetitive and tedious. This is something that cannot be avoided as only by studying the alleged words and actions can we hope to reach some conclusions. Though with so many confusing proclamations it is hard to affirm many definite statements of fact. The reader will hopefully understand as we trawl through the statements. (1.) Messages relating to navigation. (2.) Service messages relating to the conduct of the Radiotelegraphic Service, or to previous radiotelegrams transmitted by the station concerned. Of relevance to our discussion is the first point, as it covers ice warnings transmitted to ships. It would be easy to think that information vital to the safety of life at sea would be given prominence above all other matters, but as we shall see, this is not the case at all. The very first messages were undoubtedly treated with some respect, and had been marked off on the navigation chart. But during the course of the Titanic's brief life, this "respect" gives way to some form of laxity. Messages that were received and acknowledged vanished, and other reports were dismissed and wound up in some unaccountable ether. Another point to bear in mind is that the Marconi operators signed on as members of the ship's crew. While paid by the Marconi company, they answered directly to the Captain and, as we shall see, on some occasions, the first, and most vital point in the list above, was not always adhered to. 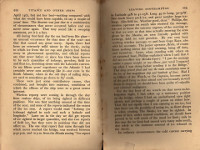 Diversions from the main text, to explore gleanings from the testimony, or to provide peripheral details, are in italics. Our narrative, which shall be chronological, begins at the time the Titanic's only voyage began. 4th Officer Boxhall testified in America that the Captain gave him some ice wireless messages from Southampton, he thinks, before they had sailed; he was slightly less sure at the UK Inquiry, saying that they got them leaving Queenstown or leaving Southampton. These "undoubtedly" ended up on the notice board. Even Pitman noticed them (though it must be said that when asked at one point during the US Inquiry if there were any warnings or notice pegged up prior to Sunday or during Sunday, he said "not to my knowledge" and that the one position marked on the chart was the "Caronia's", which we shall come to presently). Sent to the Titanic at 7.10pm on April 12th, the first ice warning in our discussion was sent by "La Touraine" and was prefixed "M.S.G", or Master's Service Gram, a message transmitted on the subject of the navigation of the ship, sent by the Master, or Captain. It read, "From 'Touraine.' To Capt. 'Titanic.' My position 7 p.m. G.M.T. lat. 49.28 long. 26.28 W. dense fog since this night. Crossed thick ice-field lat. 44.58 long. 50.40 Paris saw another ice-field and two icebergs lat. 45.20 long. 45.09 Paris saw a derelict lat. 40.56 long. 68.38 Paris please give me your position best regards and bon voyage. Caussin." Referring to the city of Paris, a small correction would have to be made to get the position with respect to the Greenwich meridian. The Titanic replied as follows: "Office received from M.G.Y. Time received 7.45 p.m., 'La Touraine' Office, 12 April, 1912. Prefix M.S.G. ... from 'Titanic.' To Capt. 'La Touraine,' Thanks for your message and information. My position. 7 p.m. G.M.T. Lat. 49.45; long. 23.38. W. Greenwich; had fine weather; compliments. - Smith"
It should be noted that the transcript of this message in the book "Titanic - Signals of Disaster" gives the longitude of the derelict as being 63.38, the Captain's name as Coussin and the Titanic's latitude at 7pm as being 49.5; the above comes from the British Inquiry transcripts. Boxhall put these ice positions on the chart and he said at the US Inquiry that they were considerably north of the ship's track, saying that "they were between the northern track and the southern track," the 'northern route' being the one that was used between August and January. Boxhall remarked to the Captain that "La Touraine" had been north of the track all the way over, and they were so far off the Titanic's route that they were deemed to be of no use. Nonetheless, they were placed on the chart. The course (yellow) and approximate position (red) of the Titanic at 7pm on April 12th. "La Touraine's" ice warnings are marked in green, corrected for the Greenwich rather than the Paris meridian. Local Time at noon on board the Titanic has been calculated and the ship would be at 50 06 N, 20 43 W; at this point she would be about 1 hour 23 minutes behind Greenwich and this is the time difference that the Titanic would keep for the remainder of April 12th. Therefore, "La Touraine's" message would be received at about 5.47pm and a reply transmitted at 6.22pm on the Titanic. Bride's morning watch was normally from 2am till 8am, and one presumes that this 6 hour pattern was repeated during the remainder of the day. As he said in London, he did of course take time out for meals or, as he put it, "during the day, [they] relieved each other to suit each other's convenience," agreeing with his inquisitors in London that no regular shift was held, but that nevertheless, a constant watch was kept. Bride claimed not to have knowledge of any ice warnings except the first of the "Californian's" messages (see later), and yet "La Touraine's" call came in during the time when he nominally would have been on duty judging by the shift rota. With reference to messages addressed to the Captain, a salient point was made by Lightoller: "It is customary for the message to be sent direct to the bridge. If addressed "The Captain," or "Captain Smith," it is delivered to Captain Smith personally, if he was in the quarters or about the bridge. If Captain Smith is not immediately get-at-able, if not in his room or on the bridge, it is then delivered to the senior Officer of the watch. Captain Smith's instructions were to open all telegrams and act on your own discretion." Obviously the dates have to be wrong, but I am not sure why. We know La Touraine was in 49.28N 26.28W at 7 pm GMT on April 12 on the way from New York to Le Havre. Average speed of the ship is listed at 19 kts so working back to the positions of the ice sightings that places it on the 10th and 11th, and this is confirmed by a report in the New York Times April 17 that states midnight on the 10th passed slowly through a field of ice for one hour and next morning passed other bergs. The report is very similar to that as radioed to the Titanic but does contain some additional information so that suggests it was a separate message perhaps sent directly to the the Hydrographic Office. Perhaps this was sometime later giving rise to the contradiction of dates. Please note the differences in the longitudes of the reports. The French adhered to the longitude from Paris until about 1914 when they finally accepted Greenwich. This is a difference of approximately 2 degrees 20 minutes so that has to be subtracted from the French longitude positions. Also the HB reports say the bergs were 12 miles northward so to be accurate 12 minutes should be added to the plotted latitude positions. The positions on the chart above have been adjusted to that of the Greenwich meridian; interestingly, Brian's data puts the second of the ice warnings even further north and hence even less of a menace to the Titanic's navigation; however, I have used the latitude as reported to the Titanic. The difference in dates is a mystery though." At the British Inquiry, Boxhall testified that another ice message came shortly after the one from 'La Touraine' and he put the data from the two ships on the chart at the same time. He differentiates this message from the one received from the "Caronia", received later but could remember nothing of this unknown report except that the ice was well to the north of the track. The Solicitor General, Sir John Simon, said that he could not trace this message at all. 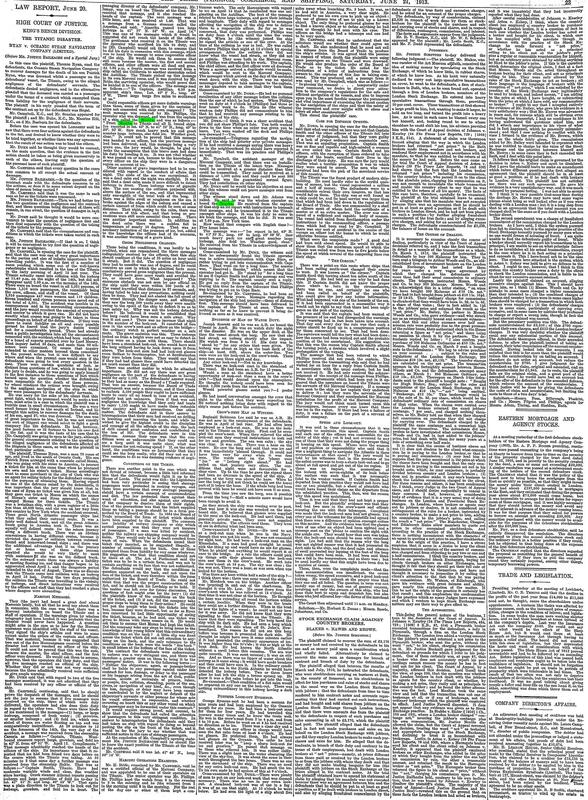 Although it is debatable whether the Rappahannock used her morse lamp to warn the Titanic of ice (see David Gittin's site), it is included here for completeness, as is a video with Captain Albert Smith. Needless to say, it was never mentioned at either 1912 inquiry. If it did happen, it was probably on the night of Saturday, April 13th. The only ice report that this author has been able to find was in a Lloyd's publication, where it reported that on April 11th, the Rappahannock passed through heavy field ice during dense fog. This was at 43.20 N, 48.45 W, 645 nautical miles from Halifax, her port of departure, which she left on April 9th. It is conceivable that the Rappahannock did meet ice based on her speed of 13 knots but it was too far north for it have interfered with the Titanic's navigation at all. At 7.10am New York Time on April 14th, the "Caronia" sent the following message: "Captain, 'Titanic.' West-bound steamers report bergs, growlers, and field ice in 42 degrees N., from 49 to 51 W. April 12. Compliments. Barr." The time on the Titanic would be 9.12am. On the bridge, we would have Lightoller with Boxhall and Moody, and Phillips manning the wireless set. The ice was slightly to the north of the Titanic's westbound track. The message was prefixed M.S.G. Captain Smith sent off a reply: "Time received 1.26pm. Date, April 14th, Captain 'Caronia.' Thanks for message and information. Have had variable weather throughout - Smith." The course (yellow) and approximate position (red) of the Titanic at the time of the "Caronia's" message. The location of the ice warning is in green. The times of this message are interesting. Captain Barr of the "Caronia" reported he sent off the original at 9am and was positive he received a reply at 9.44am, both these times being local time on the ship. On face value, the Marconigrams indicate a delay of over 6 hours. Michael Hughes, the curator of the Marconi archive at the Bodleian Archive in Oxford, informed me that, at 8am, the "Caronia's" ships clocks which measured the time relative to land changed from New York Time to Greenwich Mean Time; that is, they were adjusted to 1pm almost certainly because she had passed 40 degrees West, heading east. "1.26pm" is therefore Greenwich time and seems to refer to 1 hour and 16 minutes after the transmission of the original at 7.10am, New York Time. At this time (9.12am), Lightoller would be on duty when the warning came in, but had gone off watch at the time of receipt. 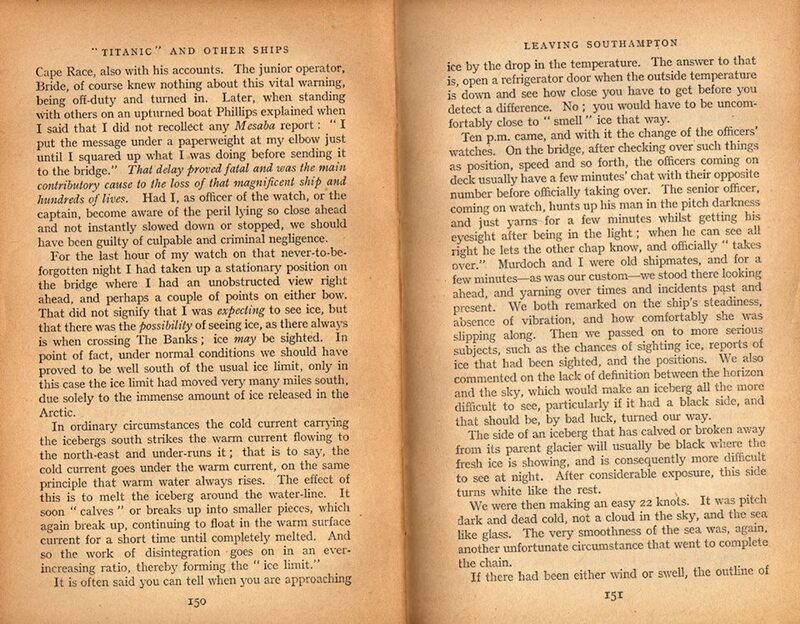 He testified that Captain Smith did not tell him he had received the message when it came in; but later on, when he had relieved Murdoch for lunch at about 12.45, the Captain showed him a Marconigram regarding ice and asked him to read it. Although Lightoller did not remember the ship, he made a mental note of the meridians and later testified that it was the "Caronia" message that he had been shown. This is the first warning that Lightoller had any recollection of hearing. He did not form any opinion as to when they would reach ice at that time except to roughly work out that it wouldn't be before he came on watch again to relieve Wilde, at 6pm. After going off shift, Lightoller's next stint on the bridge was a brief period between 11.45 and shortly after 12.00 when he helped to take the noon sun sightings with Smith, Wilde and Murdoch. For some reason, Smith did not mention the "Caronia's" message at this time, but waited until Lightoller had come on duty temporarily for Murdoch to have his meal. It doesn't help that in London, there was continual confusion about the time - Captain Barr's 9.44am ship's time becomes New York Time! When Murdoch came back from lunch at about 1pm, Lightoller mentioned the ice report to him and the 2nd officer was asked at he inquiry if his superior was aware of the Marconigram or if it was news to him. Lightoller said, "That I really could not say, whether it was fresh news to him or not; I should judge that it would have been, but I really could not say from his expression - not from what I remember" and that it was "probably" news to him. The "Caronia's" message was the only one that Lightoller claimed to have known about; he had heard of none other, recalled no conversation and did not have any "distinct recollection" of having seen any other, either pinned up on the notice board in the chart room or on the chart itself, which he admitted they were "continually in touch" with; under the regulations of the White Star Line, the officers were required to consult the chart before going on watch but he admitted they usually just took a glance at it. No one called his attention to the "Caronia's" position, marked on the chart, when Lightoller retired for the night. In fact, no one called his attention to any telegram message. Pitman was another who saw this message but he had some problems remembering the details: in America, he thought that he heard about the message either Saturday night or Sunday morning. He saw the cross on the chart with "ice" in front of it and that it was to the northward of the track; there was no ice reported on the track. This is the only position he recalled on the chart and he remembered Captain Smith showing the position the officer on watch, or one of the junior officers, telling him to take the position and put it on the chart. The report was put in a rack and the position was noted on a piece of paper and stuck in the frame of the chart room notice board. Pitman's memory soon improved and he related this had taken place some time on Sunday. 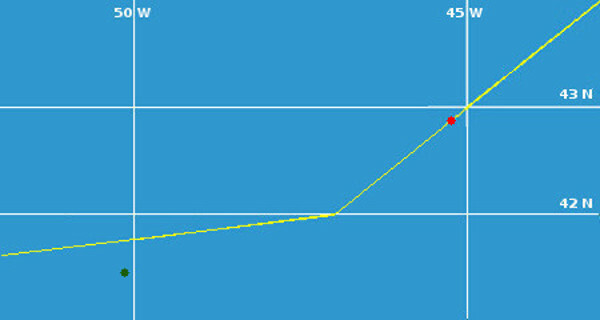 Eventually, he recalled it being put on the chart between 4 and 6pm, saying that it was probably Moody who had placed the mark on the chart as Boxhall did not remember doing so. The mark was certainly there when Pitman came back on duty at 6pm. But given a few more days, Pitman's memory had become sufficiently rekindled for him to admit that it was the "Caronia" message he had seen. Previously, he could not even remember the name of the ship! On the day of his admission, George Turnbull of the Marconi company had given evidence and it is probably that his data refreshed Pitman's fragile recall. And if this is the case, Turnbull had also helped to dispell a mystery from Pitman, for, two days before, the ex-3rd Officer had said that he had seen not one, but two Marconigrams in the chart room, this one also having come in on Sunday. Now he said he could recall but one and his conviction increased over time. It seemed that that the mysterious second message related to an oil tank steamer (two or three of which had been reported, according to Boxhall) and that Pitman claimed that he was confused during questioning between the Marconigrams he had seen, and the Marconigrams describing ice that he had seen. Even this is not satisfactory. Pitman's testimony was read back to him and it was obvious that he mentioned two reports when he was asked about "Marconigram[s] that reached the ship with reference to ice." What does Boxhall have to say about this? He testified that he put all the ice marked on the Captain's personal chart himself. Subsequently he agreed that he marked the chart in the chart room himself between 4 and 6pm, as Pitman said, but he had no recollection of doing so himself though he did eventually remember that the Marconigram from the "Caronia" had indeed been received. When he went off duty at 6pm, he did not notice any other marks on the chart regarding ice that he had not noticed before. He admitted that he wrote the chit that was stuck into the frame of the notice board himself. He had copied it off the information on the board to save taking the telegram down; the reports themselves would be on the board for all the voyage and were as Pitman said, "always accessible." Lowe had also casually noticed that there a slip stuck in the notice board frame of the board showing the word "ice" and below it, the position of the ice but knew nothing more about it. He did not trouble to examine it carefully himself and did not take it out. This was sometime after 2pm on Sunday and he stated afterwards that it must have been "new" because it had not been there before. He did not see the memorandum again (possibly because his time in the chart room afterwards was limited?). At any rate, he was so unconcerned, he did not ask for the memorandum again and no one drew attention to it again; he didn't even remember communicating the content of the chit to anyone. At the British Inquiry, Lowe gave a few more details and said that the "square chit of paper measuring 3x3" was on the chart room table itself and that he saw it possibly shortly after 6pm, making a mental calculation that they would not encounter the ice during his watch. Lowe saw no other information regarding ice and did not remember looking at the notice board to see if there were any other messages. The astonishing thing about the "Caronia" message is that despite it being sent soon after 9am, it wasn't placed on the chart till after 4pm. It was the only warning that all the surviving officers recalled and it is astonishing how casually it was treated. This is perhaps a perfect example of the casual way the warnings were treated. A previous essay of mine says; "The Marconigram held by the Bodleian Library in Oxford puts the date of this message on April 13th and says that it was also addressed to the Captain of the Cincinnati. This message was also sent to the Captain of the Celtic on 14th April, saying that the Caronia had had "mod westerly winds and clear weather since leaving." In reply, Hambelton of the Celtic replied that they too had had "mod weather all the weather" and that "today Tunisian reports berg seen in 43N 40W."" On April 14th, the "Noordam" transmitted the following: "Captain SS Titanic Congratulations on new Command had moderate w[ester]ly winds fair weather no fog much ice reported in lat 42.24 to 42.45 and long 49.50 to 50.20 Compliments Krol." The reply was as follows; "Captain Noordam. Many thanks had moderate variable weather throughout compts Smith." The message was relayed to the Titanic via the "Caronia". The course (yellow) and approximate position (red) of the Titanic at the time of the "Noordam's" message. The area denoting the location of the ice is bounded in green. The "Caronia's" wireless log confuses the timing issue. It is sometimes reported that this warning was received in the late afternoon, but the "Caronia" says that it received 2 messages from the "Noordam" at 2.31pm and transmitted them to the Titanic at 2.45pm; a reply was received at 3.29pm, and another message was sent off to the Titanic at 5.35pm (the reply to the "Noordam" was sent by the "Caronia" at 3.50pm). It is unclear what the last message is. But the "Caronia's" log makes it clear that these times are relative to Greenwich. The ice message was therefore sent to the Titanic at 9.45am New York Time, or about 11.47am on the Titanic. The reply was received at 10.29am New York Time/12.31pm Titanic Time. At this time Phillips would probably be on duty. The officer rotation on the bridge would be Murdoch, Boxhall and Moody when the message came in, and Murdoch, Pitman and Lowe at the time of receipt to the "Caronia." There is a small possibility that the "Noordam" message may be the unknown report mentioned by Boxall; it was to the north of the Titanic's track (as were all the messages he recalled), but it was not received soon after "La Touraine's" as he said, and the locations of the ice were not marked on the chart. All we can say about the "Noordam" message is that it certainly was received. As for who else was on duty at the time, Murdoch was on duty when the message came in and was acknowleged. Boxhall and Moody, and then at 12pm, Pitman and Lowe would be the junior officers. It is disturbing that the Noordam's message disappeared even though Smith definitely saw it. At 11.45am, the following message was sent to the Titanic by the "Amerika", to be relayed to the Hydrographic Office in Washington via Cape Race when the ship came within range of the shore based station at Cape Race: "Amerika Office. 14th April, 1912. Time sent at 11.45 a.m. 'Amerika' passed two large icebergs in 41 27 N., 50 8 W., on the 14th of April. [Captain] Knuth." The message was prefixed with M.S.G with the added information "Service instructions: Via Cape Race." The time on the Titanic would be about 1.47pm; it is likely that Phillips was on duty. He was certainly on duty at 2pm as Bride testified later. "Titanic - Signals of Disaster" puts the time of the above as being 11.20am, but said it was sent to the Titanic at 11.45am, which corresponds to evidence given at the British Inquiry. The course (yellow) and approximate position (red) of the Titanic at the time of the "Amerika's" message. The position denoting the ice warning is in green. Boxhall's evidence is confusing on this issue: he testified in the US that when he was shown the ice positions he recognised them and that of "the German boat, the Amerika" which they received after "La Touraine's". He put them on the track and to the best of his knowledge, they were northward of the ship's track. However, one is reminded of the mysterious message that Boxhall could not recall and which he testified to weeks later in London (see above). If the unknown ice message was the "Amerika's", it seems that he had changed his mind and could no longer be certain; he did say at one point that he did not remember the "Amerika" message at all! It would therefore seem that the wireless operators did not use their initiative and think that an M.S.G, albeit with instructions to be relayed to another station, should be given to the Captain. George Turnbull, the deputy manager of the Marconi International Marine Communication Company said that the general practise would be treat the message as a private one but the operator, seeing how important the contents were in relation to navigation, would (or should!) have communicated its contents to the Commander or to a responsible officer. The "Amerika's" ice warning was not, incidentally, to the north, but a few miles to the south. Boxhall remarked that if he had put down any ice positions that were south of the ship's anticipated route, he would called the Captain's attention to them. To his knowledge, none of the ice he knew about was on the track and if it had, word would have been passed around immediately and one of the junior officers would plot the position on the chart. Pitman also did not know of this message; he said in London that the ice messages were to the north of the ship's track. And to further confound the issue, Boxhall also said that he did not hear of any reports the day of the accident, which rules out the "Amerika". But later on, he admitted that it was quite likely that he must have done one after he was reminded of it (this turned out to be the "Caronia's" message) but he could not remember doing so. He remembered pinning the note to the board. Interestingly, Boxhall had referred to the fact that French steamers, like "La Tourane", did not follow the accepted steamer tracks and had steamed north, across the Grand Banks. The "Amerika" was the opposite case; for an eastbound ship, she should have been below 41 degrees North at this point in her crossing. The "Baltic" sent two messages to the Titanic at 11.55am on April 14th. This was New York time, so the corresponding time on the Titanic would be 1.57pm. A reply was sent out at 12.55pm/2.57pm. The relevant message, prefixed M.S.G., is as follows, but is marked as being sent as 11.52am (this was described as being unimportant at the British Inquiry): "From s.s. 'Baltic,' April 14th, to Captain Smith, Titanic, Have had mod var [moderate variable] winds and clear fine weather since leaving. Greek steamer Athenai reports passing icebergs and large quantities of field ice today in lat. 41 51 N., long. 49 52 W. Last night we spoke German oil-tank steamer Deutschland, Stettin to Philadelphia, not under control, short of coal, lat. 40 42 N. long. 55 11 W. Wishes to be reported to New York and other steamers. Wish you and Titanic all success. - Commander." The reply was "14th April. 'Baltic' Office. Received from 'Titanic' 12.55 p.m. Commander Baltic. Thanks for your message and good wishes; had fine weather since leaving. Smith." The course (yellow) and approximate position (red) of the Titanic at the time of the "Baltic's" message. The position denoting the location of the ice is in green. Under scrutiny at the British Inquiry, it was revealed that the Captain of the "Baltic" had written an affidavit stating that his ship had passed on reports "from a number of steamships of having passed ice and bergs in positions varying from 49 9 W to 50 W on the outward southern track. These ice report were in the ordinary course sent out by the operator to all other ships with wireless including the Titanic. The messages were sent off shortly before noon, New York time, on 14th April. Our operator received an acknowledgment from the 'Titanic' about 1 p.m. on the same day." But this is unsatisfactory as the "Baltic" message above refers to a single co-ordinate whereas the affidavit refers to a range of longitudes. Maybe the captain had condensed them into one single approximate point? Additionally, the affidavit refers to reports (plural). This led to more analysis of the "Baltic's" reports, where it was related that they were passed on and acknowledged by the Titanic at 1pm New York Time (3.02pm Titanic time). Superficially, this would indicate a swathe of reports sent to the Titanic about which we know nothing. But the Marconi official was asked at the British Inquiry, "As I follow ... looking at the procès-verbal of the "Baltic," you do not find about this time any other messages about ice sent by the "Baltic" to the "Titanic"?" The answer was a simple "No." This does not necessarily mean anything; as we shall see shortly, the "Baltic's" proces verbal (wireless log) from this period lacks sufficient detail to tell us what was sent - if anything. But it is strange that the familiar "Baltic" message reproduced above was recorded but the others were not. Perhaps the Inquiry Commissioner was accurate in his summary when he said that information regarding the line of icebergs from 49 9 to 50 20 W which were supposed to have been sent to the Titanic ... may not actually have been. Regardless of what was sent and when this Marconigram is another mystery. Again, no survivor on the bridge saw it. At the time the message came in, Murdoch was on duty but was just about to switch with Wilde, with the junior officers being Pitman and Lowe. What happened to this message has become infamous in Titanic circles, for it wound up in the pocket of White Star Line Chairman, J.Bruce Ismay, ostensibly a passenger on board the ship. The minutiae of this story is frustrating as it relies on foggy memories. Ismay claimed that he was talking to some passengers (possibly Mr and Mrs Widener) on "A" deck when the Captain came along, handed him the Marconigram, which Ismay looked at casually and absent mindedly put in his pocket. Smith strode on, without saying a word or even stopping. Titanic author Don Lynch says that he doesn't believe Mrs Widener gave any kind of interview and that she didn't dare. Her father-in-law was on the board of the IMM and her testimong would have been "a conflict of interest." Ismay thought the telegram had been handed to him as a matter of interest, and not as a way of seeking advice. Certainly, Ismay claimed not to have understood that there was ice in their path. He professed not to understand latitude and longitude. He did not attribute any special important to the ice report at all, but thought that it conveyed that they were approaching the region where ice had been reported. Some speculate that handing over the telegram was a hint for the ship to slow down. There is another reason; the Captain may have thought that Ismay may have been interested in information from another ship of the line. The total absence of interaction between the two when the message was handed over is odd, if not downright suspicious. Ismay claimed that the "Baltic" message was the only one that was handed to him. He admitted that he had travelled with Captain Smith before and had been handed messages which had been of no important at all, which, of course, cannot be said of the "Baltic's" vital message which described ice practically in the Titanic's path. In fact, the "Baltic's" message is the very first that put ice very near to the ship's track. Is it coincidence that this one message was given to the Chairman? No one can say for sure. When did the above interaction happen? In the inquiry in London, Ismay said that the bugle for lunch sounded almost immediately and he went down for his meal. As usual, this is his "best recollection." It would be somewhere about 12.50pm, but even he was not sure, first of all saying 1.20pm and then 1.30pm, which conflicts with his own evidence that he received it before lunch, which he said was at 1.00pm (in America, he had said he might have been given the telegram in the afternoon). This cannot be right. The message wouldn't have been received until nearly 2 o'clock. And would the Captain have handed the message over, without first sending out an acknowledgement to the "Baltic", which was at nearly 3 o'clock? What ultimately happened to the Marconigram? Here a curious, and contradictory tale emerges. 'Of course, you will slow down,' I said. 'Oh, no'; he replied, 'we will put on more boilers and get out of it.'" Major Arthur Peuchen also confirmed the story, which appeared in "The New York Tribune" on April 20th, 1912. Ismay called it "absurd" (this quote appeared in "The Washington Herald" of April 21st, 1912; interestingly, this paper garbles the story by saying that Peuchen, who said he heard the story at the same time as Mrs Douglas, stated that Mrs Ryerson went to Ismay and said that she had heard that the wireless had reported "a large number of icebergs in the path of the ship. Are you not going to order her to slow down?" He replied, "On the contrary, Mrs. Ryerson, we are going to go along faster than we have been going." The paper said this was repeated privately to the Senate Inquiry but if so, it is not a verbatim quote. Regardless, the gist is the same. Peuchen did not relate this story when he gave his evidence to the inquiry). Mrs Carrie Chaffee, a 1st class passenger, also told a paper, "Mr Ismay and all the ship's officers were aware that we were passing through the ice fields. All of them talked about it even at the tables. When several of the passengers begged that the ship's terrible speed be reduced, all we received in answer were smiles." A factual story, or one manufactured out of fury and indignation at the disaster? Word of the proximity to ice had certainly filtered amongst the passengers and crew. This is what Edith Rosenbaum wrote in 1913; "On Sunday, April 14th, the weather was brilliantly fine, but icily cold. I remarked upon the cold to my steward, and said that it was so cold that I decided to stay in my bed, as that seemed to be about the only warm place, which I actually did, until four o'clock in the afternoon. The steward explained the cold was due to proximity to an ice-field." Mr Ismay, when told of the statement attributed to him, said: "I never said anything like that to Mrs.Ryerson or to anybody else." He did later confirm that he had spoken to Mrs Emily Ryerson and Mrs. Marion Thayer that afternoon about the warning. But, as recounted by Mrs.Douglas above, exactly what was said was vastly different. Ryerson's opinion of Ismay at that meeting was reported in "The Daily Telegraph" of April 22nd: "[his manner] was that of one of authority and the owner of the ship and what he said was law." Although she knew Ismay be sight, this was the first time she had seen on this crossing. She went on "A" deck with Mrs Thayer around sundown, possibly aroud 6pm and they sat on some chairs. Mr Ryerson went to have a walk and a chat with Mr Thayer, and Ismay came up and, seating himself on the end of a steamer chair, spoke to Marion and Emily, speaking pleasantries such as whether their staterooms were comfortable and so on. Then Ismay produced a Marconigram from his pocket, which Mrs Ryerson said was handed to her (she later said that it was held out in front of her) and she glanced at it. Ismay said, "We are in among the icebergs...we are not going very fast, 20 or 21 knots, but we are going to start up some extra boilers" but she was hazy as to whether this would be that evening or night. Ryerson couldn't remember whether he said two or three boilers but she knew that, regardless of the number, it meant going faster. Inquiring about the rest of the telegram, he told her, "It is the Deutschland wanting a tow, not under control," prompting her to ask what they were going to do about it, to which Ismay replied that they were going to do nothing. Ryerson was left with a strong impression on her mind that the Titanic was going to get in to New York and surprise everyone, and that they couldn't afford to delay assisting other ships. She testified, "There was some discussion about [getting in at a particular time], and my impression was it would be very late Tuesday night, or early Wednesday morning, because I discussed it with my husband after I went down stairs and the question was what we would do if we got in so very late. But as I say, at the time the conversation had no importance to me ... I carried on the conversation merely to keep the ball going, and the words have faded from my mind; but the strong impression left on my mind I can remember perfectly, but not the words." In fact, all she could remember of the Marconigram from her casual glance was the word "Deutschland." After talking less than ten minutes, Mr Thayer and Ryerson returned and Ismay departed. As for the 1912 quote from Mrs Douglas, Mrs Ryerson said that speeding the ship up to get out of the ice was simply an impression. Her other impressions, or feelings, were that Ismay's attitude or his language implied that they wanted to make a record crossing. Grace Scott Bowen was a friend of Mrs Ryerson's and was also travelling on the maiden voyage. She too told her story in 1913: on the Titanic on the afternoon of the 14th, she went and sat about four chairs away from Emily and saw Ismay come up and speak to the ladies. He had a white slip of paper in his hand which he appeared to show to them. Soon after Ismay had departed and the ladies had headed off, Mrs Ryerson told Bowen that Ismay had come and spoken to her. She didn't know him very well and objected talking to people [the family were hurrying back to the US after learning of the death of their son]. In fact, Mrs Ryerson seemed utterley bored of Ismay, but Bowen did state the following: "As I remember, she said he said we were among the icebergs; and some of us said that was why it was so cold; but I don't mean, necessarily, he said so; and that the Deutschland had sent a message she was out of coal, and that we weren't going to bother about that, because - well, I can't remember whether she said because they wanted to make this a record trip, or because they wanted to see how soon we could get in. I should say she said a record trip and didn't want to be delayed. And she also said we hadn't been going at our best speed, and they were expecting to start up three more boilers; she didn't say Mr. Ismay said they were going to start up the boilers in order to go faster, that was the impression I ---" at which point, counsel for the White Star Line objected and the evidence veered onto a new topic. The use of the word "impression" and the similarity between the two lady's evidence might be seen as suspicious, perhaps. Returning to his 1912 testimony, Ismay could not recollect what he said to the ladies, but thought he read out part of the message about the ice and the steamer that had run short of coal. He "certainly [did] not" say that they would put on more boilers to get out of the ice region when Mrs.Ryerson asked if they would slow down. Two years later, at the Limitation of Liability hearings, Ismay confirmed his story, saying that he did not "show" the telegram to anyone else on board the ship (which technically is correct as he said he held it up to them at a distance of 4 feet), although he had very little recollection of what he had said to the two ladies. Whom do we believe? It is very easy to find suspicion in the overuse of phrases such as "I cannot recall." Some have said that Ismay lied because it pointed to him being more than just a mere passenger - and potentially interfering with the navigation of the ship by insisting on more speed, which would have been a litigious nightmare for the White Star Line. But similar accusations could be said about Mrs Ryerson. She had lost her husband in the wreck. Was she so indignant and upset that she manufactured the story about the ship speeding up? Other passengers and crew remarked that the ship was indeed travelling faster than ever on the night of the collision. Some remarked on the vibration, and others too had heard that the ship would be getting in on Tuesday evening rather than Wednesday morning. And there we must leave the matter. The telegram was never seen again. It was not placed in the chart room as no one recalled seeing it delivered or marked. The only other clue comes 28 years after the disaster when John B. Thayer Jr (Mrs Thayer's son) wrote a long memoir and he had this to say, "It became noticeably colder as the afternoon wore on. I remember Mr. Ismay showing us a wire regarding the presence of ice and remarking that we would not reach that position until around 9 pm. We went to our staterooms about 6:30 to dress for dinner. My father and mother were invited out to dinner that night, so I dined alone at our regular table." The time that he was shown the message would put it at approximately the time that Ismay encountered his mother and Mrs Ryerson. But is it possible that in 28 years, Jack Thayer's memory had become blemished? His memoir does have quite a few details that are at variance with the known facts of the disaster. If his statement about the ice message is an accurate statement, then how did Ismay know that they would not reach that position until 9pm? He professed to know nothing about nautical matters, including latitude and longitude. The 9pm time is very close to the one estimated by Lightoller (see later). Is this a coincidence? And the longitude in the "Baltic's" message would not be reached until well after 11pm. Intriguingly, at the Liability depositions, the following was reported by the New York Times on June 25th, 1915: "[John Thayer Jr.] and his father were constantly in the company of J. Bruce Ismay on the first few days' run, he said. Mr. Thayer said he talked often with Mr. Ismay, and told of a conversation he and his father had had with the Director of the line on Sunday, the day of the sinking. During the course of a conversation with Mr. Ismay regarding the speed of the ship and the time she would reach New York, the witness said Mr. Ismay made this remark: 'Two more boilers are to be opened up today.'" Unfortunately, Thayer's exact testimony has vanished, leaving just a few stray words in the newspapers of the period. Did he mention the telegram in his testimony, thus corroborating his 1940 writings? We do not know. If Ismay did hand the messsage to Smith at about 7.10, what did the Captain do with it? Smith was attending a dinner in the ship's restaurant that night, and Daisy Minahan was also there. She arrived at 7.15pm and noticed the Captain in attendance. Lest it be thought that this evidence could be used to dismiss the claim that the message was to be delivered to the chart room, it should be remembered that Minahan also reported that Smith was still at the restaurant between 9.25 and 9.45, when she left. This flies in the face of Lightoller's claim that Smith was on the bridge between 8.55 and 9.25pm when they held a conversation. However, Charles Stengel testified, "I have a distinct recollection of a Mrs. Thorne stating, while talking about the captain being to dinner, that she was in that party, and she said, "I was in that party, and the captain did not drink a drop." He smoked two cigars, that was all, and left the dining room about 10 o'clock." Also, Mrs.Bishop told the Dowagiac Daily News of 20th April, "Mr. Lucien Smith of Huntington, W. Va., a dear little woman, who lost her husband in the disaster, said that before they parted on the deck he told her he had seen Capt. Smith at a dinner at 11 p.m. that night. When he left the dining room, the captain was still there, although he may have gone to the bridge before the collision, it doesn't seem likely." If true, this would seriously dent Lightoller's credibility. George Rheims gave a deposition in 1913 and he testified that he had seen Smith and Ismay for ten minutes at 9 or 9.15pm taking coffee with a group of people outside the dining room. To be fair, Rheims memory does seem to be very precarious on other matters. Boxhall told the Senators in the US that, as near as he could tell, he saw the Captain about 9pm, as a particular incident, which he did not specify, stuck in his memory. But he was sure Smith was not away from the bridge/wheelhouse and he spoke to him on one or two occasions as he was reporting on the various calculations he was performing. The Captain, he said, was around there the whole of the time from 9 o'clock to the time of the collision, which conflicts with the statements above that he was at dinner for a large portion of this time period. There is one further point: Boxhall said in London that on one occasion there was a message about a tank steamer - almost certainly the Deutschland - drifting on the track. Smith mentioned this to one of the officers and told him to tell Boxhall to put the position on the chart. This is not necessarily the "Baltic's" message as other reports had come in two or three days previously of this crippled ship. In fact, if Boxhall's recollections are true, it certainly wasn't the Baltic message as he didn't remember the it at all. Marconi Wireless Inspector Balfour on the Baltic provides a mystery in his testimony; shortly after discussing the message sent to them, he said, "We gave him the unofficial ice report at the same time as we sent the original message, simply verifying the report that we got from the Prinz Friedrich Wilhelm and from the "Amerika". I heard those ice reports going to him from the Friedrich Wilhelm and the "Amerika", and I just verified their position with him unofficially." It is unclear what to make of this. Balfour is clearly differentiating between ice warnings from two ships, but only the "Amerika's" is known. A query to Michael Hughes about the Prinz Friedrich Wilhelm's proces verbal yielded no mention of an ice warning sent to the Titanic. But he does say, "It's perhaps worth noting, in case you're unaware, that the PVs for these and other German vessels are evidently copies transcribed from originals by Debeg and sent as a group to Marconi for use in the UK Inquiry - the PV forms used have consecutive printed five-figure numbers so that e.g. Ypiranga's follows on from the single page for the Prinz Friedrich Wilhelm. Also there is a covering letter in German from the German company (Debeg) sending these PVs to the Marconi company. Since only one entry for the Prinz Friedrich Wilhelm has been transcribed, it would seem that the transcribed entries are not necessarily comprehensive and only those relevant to the Titanic have been included. Consequently there is an implication that no ice warning to the Titanic was recorded, but we cannot be sure. Also, the occurrence of the transcription does provide another opportunity for errors to have crept in." The "Baltic" log mentions "3.0p(m) Sigs MGY [The Titanic] 3.40p Sigs DKF [Prinz Friedrich Wilhelm] 4.0p Sigs MGY" - there is no mention as to what the 3.40pm message entailed. Balfour says that no other messages were received from the Titanic, but it is unclear as to whether he means at the time of the original message, or whether he meant pertaining to ice. As stated, Balfour said that he verified the Prinz and "Amerika" positions with the Titanic, so it is hard to understand what he meant when he said that he got no other messages from the White Star ship. A diligent search of ice warnings recorded in the US Hydrographic Office bulletins and other United States sources, as well as Lloyds publications yields no report of any ice warning originating from the Prinz. Maybe the warning came from another ship and the Prinz was relaying it, the name of the original station being lost? It is now impossible to know. If the Prinz did contact the Titanic, there is no other mention of them doing so on April 14th, 1912. Another possibility is that Balfour was mistaken. At 6.30pm the Leyland Line steamer "Californian" saw 3 icebergs five miles to the south of them; she was then at 42 3 N, 49 9 W. At about 7.30pm ship's time (5.35pm New York), Captain Lord asked Evans to transmit the message to the "Antillian", another ship of the line. The message was prefixed M.S.G. A little later, the Titanic called up the "Californian", and the latter ship offered him an "S.G (Service Gram) ice report." The Titanic replied that he had already heard it being sent to the "Antillian" and that he had already got it. It would be approximately 7.37pm on the Titanic. The course (yellow) and approximate position (red) of the Titanic at the time of the "Californian's" message. On the Titanic, Bride's story is somewhat different. He admitted at the US Inquiry that he received this message himself late in the afternoon (about 5-5.30pm) and personally delivered it to the Captain. Bride said that the "Californian" called him up with the ice message but did not take it down as he was busy filling in the accounts and also because it seems that the equipment had been allowed to partially run down as it was liable to run hot. The "Californian" did not call again. Then between 15 and 30 minutes later, he heard the message being delivered to the "Baltic" [sic] and surmising that it was the same one that was intended for him, he acknowledged it and jotted it down, noting that it was unofficial as it was not intended for the Titanic. And since it was not official, he was not obliged to make a record of it. This is the only ice warning that Bride received, or that he had heard about. Under repeated questioning, he changed his story, contradicting his statement about delivering the message to the Captain and now saying that he had delivered the message to "the officer on the bridge" but did not know who it was; it now wasn't Smith, who wasn't to be seen on the bridge. And he denied that his receipt of the message included the mention of the receiving ship's name ("Antillian"). As far as his memory served him, the other ship was the "Baltic", though it seems that he later harboured some doubts as to this correctness. Bride also said that, "to the best of [his] recollection [the Calfornian's message] was between five and six, ship's time," and said that he did not think that he was making a mistake about the time even when it was pointed out that the ice report must have been received after 7pm; with the "Californian's" wireless log in his hand, Bride had to admit that "if" the records were right, he was mistaken. This prompted the presiding judge, Lord Mersey to interject, "does it all come to this, that his own memory is quite defective about it?" (it must also be pointed out that many other aspects of Bride's evidence raise suspicions of faulty recollections). There may be a clue to Bride's poor memory. At the British Inquiry, he said that he went off watch between 6 and 7 and went for dinner at 7pm which took 20 or 30 minutes. But confusingly, at the US Inquiry, he was asked who was on duty from 6 o'clock until the collision and he said, "I was on duty for half an hour while Mr. Phillips went and had his dinner." Again, this was from 7 to 7.30. Allowing for a few minutes either way, was Bride on duty when the "Californian" message came in? Certainly his poor memory on this matter does not impress one with much confidence on his perceptual abilities. There is another point: as previously mentioned, Ismay had handed the "Baltic's" Marconigram back to Captain Smith at about 7.10pm. Allowing for the time taken to walk to the bridge, and given a few minutes either way, there is a possibility that the message was indeed handed to the Captain that night. With this proposed solution comes further problems, for the "Baltic" message was never seen by anyone on the bridge and its position was never marked off in the chart room. And, as previously remarked, there are serious timing issues with the hypothesis that Smith was heading straight to the bridge and chart room after seeing Ismay. If the timing is right, Smith instead headed straight for his dinner date. The fact that Bride contradicted himself on who he had handed the report to is suspicious. Who else was on duty? Lightoller was in charge, but was at dinner between about 7 and 7.30pm. During his absence, Murdoch temporarily took over. Back on the bridge, Lightoller, with the assistance of 3rd Officer Pitman took stellar sights to ascertain the ship's position; this would be from about 7.30 to 7.40pm. If it wasn't Smith who received the "Californian's" message, it could have been either Lightoller or Murdoch. Except Lightoller denied receipt of the report, and Murdoch did not (seemingly) bother to tell the 2nd officer of any Marconigram that had arrived while Lightoller was at dinner. Pitman stated that the "Californian's" message would have been delivered to the chart room, where he was working until he was relieved at 8pm by Boxhall. In short, no one who survived admitted to seeing this warning. Cynically, it is easy to blame those unable to defend themselves, like Murdoch. At 5.50pm, the Titanic's course was changed to almost due west after reaching a way-point at "The Corner", 42 N 47 W. Actually the Titanic seemed to have slightly overshot the mark. This should have been done about 30 minutes earlier but the delay eventually put the ship about 4 or 5 miles south of her anticipated course. We do not know why this is as Smith did not share his reasoning with any of the other officers. Or, if he did, they neglected to mention the reason later on. 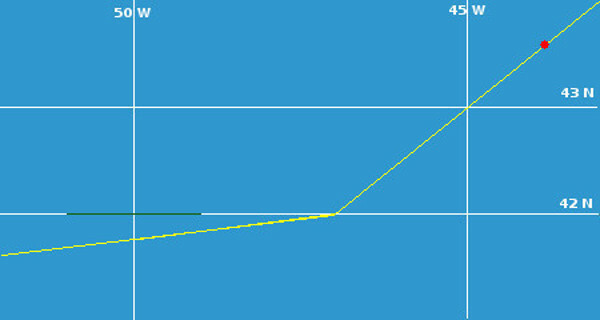 It is sometimes stated that this delayed course change was due to the "Baltic's" ice warning, which was only a few miles to the north of the original track. This reason does not bear examination, as the "safety margin" was still miniscule. The Baltic reported field ice, spread over an unspecified area and the extra margin of a few miles was practically trivial. After all, given the anticipated drift in the area, the ice could easily have impinged upon the Titanic's route by the time she reached that longitude. In summary, the tiny deviation from the true course is almost insignificant. Immediately upon arriving on the bridge for his watch at 6pm, Lightoller directed 6th Officer Moody to let him know what time they should reach the vicinity of ice. After 30 or 45 minutes, Moody reported back, "About 11 o'clock." Lightoller claimed that he too had performed some mental calculations and decided that the time would be about 9.30 based on the only Marconigram that he had seen, from the "Caronia" (Lightoller at first said that he had calculated this before Moody had given him his time, but later corrected this saying that he had done so between 7 and 8pm). Lightoller did not correct Moody or ask him to repeat his calculations as the junior officer was busy "with some calculations, probably stellar calculations or bearings" and thought that he had used a different message, or messages than the one he had seen. However, the 2nd officer did not know what these could be as he had seen no other Marconigrams. Lightoller's memory must be faulty if he thought Moody was busy with position-related calculations before 7pm as the star sightings were not made until 7.30 - which the 2nd officer performed, with Pitman's help. Although 3rd Officer Pitman claims not to have talked to Lightoller between 6 and 8pm (when Pitman retired until midnight), he did recall a conversation, or a remark "amongst themselves" of the ice situation. Pitman's memory is frustratingly vague. The conversation (or remark) might have been about 8 o'clock, but he could not remember exactly when or who else was involved. He was not interested and had nothing to say in the matter, he said. But there is one salient piece of information he did remember - that they should be in the vicinity of ice in Murdoch's watch. Did this information come from Moody, via whatever route? It would tie in with his estimate of 11pm. When asked about this in London at the British Inquiry, Pitman said he could not recollect speaking with any of his "brother officers" with reference to the position of icebergs but did not think, or did not remember a discussion about meeting ice that night. This may be literally true if Pitman's US evidence is true; he was so disinterested he played no part in any conversation. He was busy with his other work and made no enquiries about ice, simply accepting that the icebergs marked on the chart was quite sufficient. What can be said of the 9.30/11pm estimates? As stated, at 5.50pm, the Titanic changed her course. At a presumed speed of 21 knots, the Titanic would be up to 48 44 W at 9.30pm, close to the easternmost of the Caronia's ice longitude. But had Lightoller, with the benefit of hindsight, "reverse engineered" the intercept longitude knowing where the ship struck? He was asked about this, thus: "If she struck the iceberg at 50 14 W. at 11.40, 20 minutes to 12, given her speed, it is not difficult to say approximately when she passed the 49th meridian?" He responded, "It works out somewhere about half-past 9." This would provide a rough longitude of 49 13 W, which again, is close to the easternmost longtude given by the "Caronia". But if one uses the actual wrecksite as a basis and working backwards, one gets 48 57 W, again, very close. But what of Moody's "11pm" estimate? If we take the point the ship turned and extrapolate forwards, this works out at being about 49 25 W. There is no ice reported at this exact longitude, unless one is generous in rounding off calculations, and using slightly inaccurate speed estimates and reported ice locations. As Lightoller said, Moody undoubtedly used the easternmost co-ordinate to estimate the soonest the Titanic would reach the ice. At the British Inquiry, it was asked whether Moody had possibly used the "Baltic's" telegram; this may be so, if Moody used a different estimate of the ship's speed, this would bring him close to the longitude given in that message of 49 52 W. If this is so, why did Moody not use the "Caronia's" "closer" easternmost longitude? Was it possibly because the ice was further north than the "Baltic's" and could be neglected? Sadly for this hypothesis, there is no evidence that the "Baltic's" message was on the bridge at the time Moody performed his calculations. Boxhall seemed to have been something of the designated navigator, and the first two hours of his shift were spent in the chart room on the 14th April. Did he form an estimate of when ice would be reached? In America, he said, "From all the positions of icebergs that I had, of course I knew that we should be getting close up to those positions in the early hours of the middle watch [that is, 12-4am]; at least. I did not think we should be up to any of those positions before midnight that night." This is significantly after Lightoller's and Moody's estimate! In London, he was asked "Do you remember what region it indicated; did it convey to your mind that you at 4 o'clock [when he entered the "Caronia's" message on the chart] were somewhere in the neighbourhood of ice or not?" to which he replied, "It conveyed to my mind that the ship would shortly be in the region of the ice." Pressed further, he was further queried if he had made up his mind as to what time they would be in the ice region. He said, "No, I did not." Did he mean at 4pm, or generally that night? If the latter, it contradicts his US evidence and later, he said that it was the "Caronia's" message that conveyed to his mind that the ship would soon be in the region of ice ... but if this is the case, his timings are awry. And, to cap it all, he later stated in London that he did not calculate the time, and had not "the slightest idea" when she would reach the region of ice or the "Caronia's" position. And, as a coup de grace, at one point in the US Inquiry, when he was posed the question, "Do you want us to understand that you had no knowledge of the proximity of this ship to icebergs immediately preceding the collision, or during the hours of your watch from 8 o'clock until the collision occurred?" he answered, "I had no knowledge ... I did not realize the ship was so near the ice field." Why did his opinion and memories change so much on the matter? Murdoch relieved Lightoller for dinner from 7.05 to 7.35; when he returned, the 2nd Officer was told of the drastic drop in temperature in those thirty minutes, but there was no mention of any new ice reports. 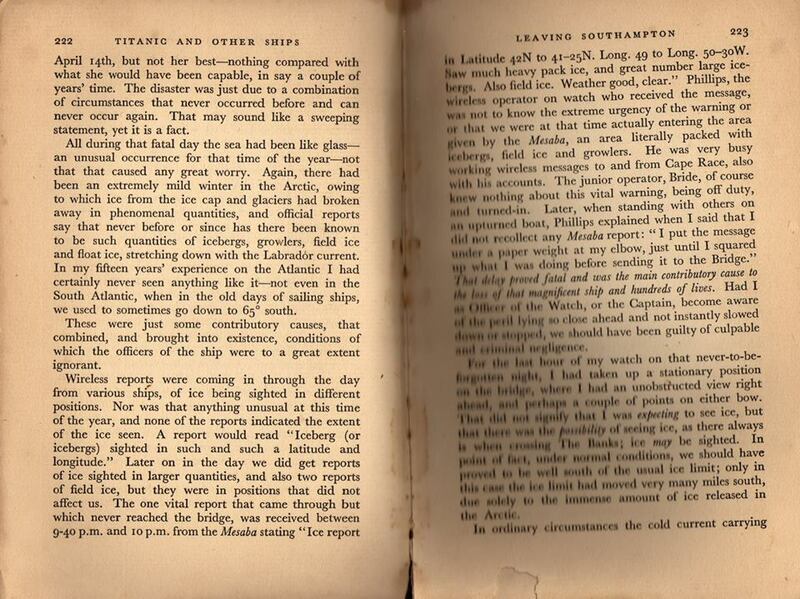 Later, when it is claimed that the Captain came on to the bridge about 9pm, the discussion with Lightoller did not mention his computation of the time when he expected to reach the ice. Moody's errant calculation was not mentioned either. When the Captain left Lightoller on the bridge, the 2nd Officer asked Moody to contact the crow's nest to inform them to "keep a sharp look-out for ice, particularly small ice and growlers." This would be at 9.30pm, perhaps confirmation that Lightoller had indeed calculated the time and asked for extra vigilance at that exact time. Maybe; but Quartermaster Hichens says this order to the look-out was soon after he had come on duty at 8pm and after he had delivered a message to the ship's carpenter. Lightoller himself said the message to the carpenter was sent just before 8.55, which is when the Captain came on the bridge. This is perhaps a good example of the endemic imprecision of times and timings that night. Finally, at 10pm, Lightoller's watch came to an end and he was relieved by Murdoch. At the British Inquiry, the 2nd Officer stated that he may have mentioned his or Moody's timing calculations, but again, he couldn't be sure: at one point in the US proceedings, he said Murdoch was informed of the anticipated time of intercept with the ice by the 2nd officer, but he gave Moody's 11pm timing, not his own, and one wonders why, as a premature, earlier time would be more of a forewarning. When one scours the transcripts, the answer becomes clearer, as Lightoller never once mentioned his own 9.30pm estimate in America! Was this a later invention based on information he had gleaned in the interim until he spoke in London? Lightoller did apparently say that they might be up around the ice at any time, or were in the ice region; his memory faltered on the exact words he used. What does stand out is that on the very first day of the US Inquiry, which was some weeks before his questioning in London, he denied talking with Murdoch about the iceberg situation, and Murdoch did not ask him. All that was talked about was the clear weather. Perhaps evasively, when this contradiction was brought up in London, Lightoller replied, "I may say by the questions that were put to me that those answers you might agree were correct as far as I understood the questions at that time" and explained that his US answer was "incomplete." An impartial reading of the testimony does not bear this out, and as will be seen soon, Lightoller was evasive on that very first day ashore of ice warnings. Stanley Adams, the "Mesaba's" wireless operator received an ice report at about 4pm from his Captain saying that it should be transmitted to all east-bound ship; however before doing so, Adams received another report at approximately 7pm, and, with the Captain's authorisation, he combined them into one. It is therefore misleading to say that the final transmission was for a huge rectangle infested with icebergs. Adams sent the message to the Titanic and about ten other ships at 7.50pm New York Time (9.40 ships time): "Prefix Ice Report. From 'Mesaba' to 'Titanic.' In latitude 42 N. to 41.25, longitude 49 W. to longitude 50.30 W., saw much heavy pack ice and great number large icebergs, also field ice, weather good, clear." Adams received a "reply received, thanks" message straight away as an acknowledgement and he timed and dated it, added his initials and the station he had sent it to. Adams noted that his counterpart on the Titanic was very busy working with Cape Race and resumed his communications with the ground station after he had received the "Mesaba's" report. Adams waited for a probable official reply from the Captain of the Titanic, perhaps with some news but received nothing. He had prefixed the message with "S.G." [Service Gram]. The "Mesaba's" message was timed at 7.50pm New York Time would be about 9.52pm on the Titanic, just eight minutes before Lightoller handed over his watch to Murdoch. This warning never reached the bridge; none of the surviving officers claimed to have seen it. Phillps was on duty at the Marconi key. Brian Hill informs me that the following appeared in the Hydrographic Bulletin 1182, April 24th; "April 14. 41 50 N 49 15 W passed a number of icebergs; also a field of pack ice about 15 miles long; and 42 N 50 W encountered a field of pack ice with numerous icebergs in it and extending from 4 points on the starboard bow to abeam on the port side. Had to steer about 20 miles south to clear it. The ice seemed to be one solid wall of ice at least 16 feet high and extending as far as could be seen. In 41 35 N 50 30 W cleared the ice. Mesaba (Br.ss. ), Clarke." Hill notes that, "So, if her message to the Titanic also incorporated ice info from other ships this at least was from her own experience." Accrording to the US Inquiry, this ice was noted at 11am (41 50 N 49 15 W) and 2pm (42 N, 50 W), and after this second one, at 4pm, they were again able to steer to the westward, seeing no more ice after this. The course (yellow) and approximate position (red) of the Titanic at the time of the "Mesaba's" message. The green dashed rectangle denotes the boundaries of the ice. Shortly after the disaster, Thomas Ryan, the father of a third class passenger who had perished in the sinking, took legal action to procure damages from the White Star Line by alleging negligent navigation. At the hearing on June 20th, 1913, Stanley Adams said that in his opinion, the "Mesaba's" message should have been taken immediately to the bridge. He said that he had waited "a long time" for an official acknowledgement from the Titanic but none came. Bride also took the stand, and stated that it was his and Phillip's practise to take such warnings to the bridge, and that they had priority over private correspondence (The report in The London Times can be found here). Over two decades after the disaster, the "Mesaba" saga reappeared, when Lightoller wrote his memoirs, "Titanic and Other Ships." In one version, he said, "Wireless reports were coming in through the day from various ships, of ice being sighted in different positions. Nor was that anything unusual at this time of the year, and none of the reports indicated the extent of the ice seen. A report would read "iceberg (or icebergs) sighted in such and such a latitude and longitude." Later on in the day we did get reports of ice sighted in larger quantities, and also two reports of field ice, but they were in positions that did not affect us. The one vital report that came through but which never reached the bridge, was received at 9-40 p.m. from the "Mesaba" stating "Ice report in Latitude 42N to 41-25N. Long. 49 to Long. 50-30 W. Saw much heavy pack ice, and great number large icebergs. Also field ice. Weather good, clear." Phillips, the wireless operator on watch who received the message was not to know the extreme urgency of the warning or what we were at the time actually entering the area given by the "Mesaba", and are literally packed with icebergs, field ice and growlers. He was very busy working wireless messages to and from Cape Race, also with his accounts. The junior operator, Bride, of course, knew noting about this vital warning, being off duty, and turned-in. Later, when standing with others on the upturned boat, Phillips explained when I said that I did not recollect any "Mesaba" report: “I just put the message under a paper weight at my elbow, just until I squared up what I was doing before sending it to the Bridge.” That delay proved fatal and was the main contributory cause to the loss of that magnificent ship and hundreds of lives. Had I as Officer of the Watch, or the Captain, become aware of the peril lying so close ahead and not instantly slowed down or stopped, we should have been guilty of culpable and criminal negligence." There are a couple of points to ponder. Lightoller is lax in telling the reader that of the many ice warnings received, only one was recalled by him and his fellow officers; and of this one it was mostly treated with a casual disregard by the survivors. The fate of the "Baltic's" message is not discussed. His mention of a conversation with Phillips is erroneous as the senior Marconi operator died in the sinking and never made it to the lifeboat, despite what was claimed in 1912. But the above extract is just one variant of Lightoller's writings. In the other, there are a few significant deviations. After giving the "Mesaba's" message, the different version reads: "The position this ship gave was right ahead of us and not many miles distant. The wireless operator was not to know how close we were to this position, and therefore the extreme urgency of the message. That he received the message is known, and it was read by the other operator in his bunk. 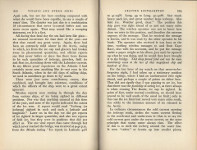 The operator who received it was busy at the time, working wireless messages to and from Cape Race, also with his accounts, and he put the message under a paper weight at his elbow, just until he squared up what he was doing, and he would then have brought it to the bridge..." the paragraph then continues as before. It should also be borne in mind that Lightoller's version of the Titanic disaster has many discrepancies with his testimony and with commonly accepted fact. As an example of his revisionist opinions, in 1912 he offered support to Captain Lord of the "Californian." In his autobiography, he was scathing. Why are there such marked differences between the two paragraphs in Lightoller's book? Walter Lord wrote to Lightoller's widow, Sylvia in 1955 and she says that, "Did you know when my husband's book Titanic and Other Ships was published it was withdrawn as they were threatened with a libel action because he told the truth about Philips and the delayed message." Did Bride or the Marconi company issue a lawsuit? It is now impossible to know for sure (the Marconi records in Oxford contain no such information). If such an event did happen, it may have been done privately. And again, it must be pointed out that Sylvia was prepared to be economical with the truth at times. The different versions of the paragraph are a tantalising curiosity. Thanks to the generosity of Titanic bibliophile and researcher Kalman Tanito, reproductions of the relevant sections from three 1930s versions of Lightoller's book were obtained. Two of these were from 1935. 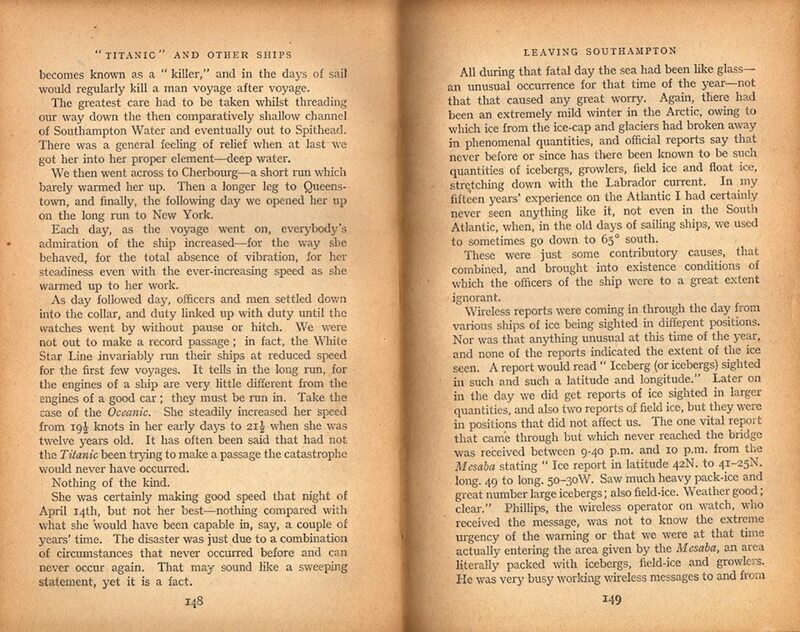 The first was an Ivor Nicholson and Watson edition, which had the "Bride reading the message in his bunk" section. The next was from the same publisher, and was actually owned by Charles Lightoller! This version lacks the inflammatory Bride section. 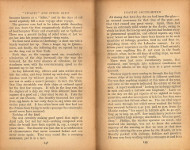 The final version is a Bay Tree version from 1939 which, again, omits the disputed section. Kalman says, "To make the matter more complicated, the Ivor Nicholson and Watson edition from 1935 ... is apparently NOT a first edition, although it does say "First Edition, January 1935"! See the same pages from Lightoller's personal signed copy in my collection, probably one of the first copies off the press. So if you have a 1935 copy that says "First Edition", check it if it truly is a first edition or not ... One further point: both Ivor Nicholson and Watson copies that I have state "First Edition, January 1935", although the passages are different (I didn't mention that Lightoller's personal copy says this as well). So there were some pretty fast changes, if they both came out during the same month. Apart from Lightoller's signature and Sylvia Lightoller's ownership markings in the (apparently) true first edition copy, there are no other annotations to help us further. I wonder how large the original print run was and which version the alleged lawsuit was aimed at, if it came out as a softcover four years after the first edition." The matter was not yet over. The ructions over Lightoller's book continued. In January 1936, an abridged version of Lightoller's book was serialised in the Dundee "Evening Telegraph." It doesn't mention Bride being in his bunk reading the "Mesaba" message which is fortunate - as the former Junior Wireless telegraphist wrote to the newspaper, taking umbrage at the newspaper serialisation! On January 15th, Bride's letter appeared, saying that "Phillips ... was one of the most skillful and experienced operators then in the service of the Marconi Company. At the Board of Trade inquiry...no proof was available that the "Mesaba" message was ever received by the Titanic. Had it been received, I say with all sincerity that Jack Phillips would have realised its importance and immediately communicated it to the bridge, for the mysteries of latitude and longitude were not confined to navigating officers. If Commander Lightoller knew all about the "Mesaba message", as he claims, why did he not say so at the Board of Trade Inquiry, and not wait until this late day to throw doubts on the efficiency of a very gallant gentleman who died procuring aid for Commander Lightoller and 701 other fortunate survivors? ... [Phillips efficiency] does not go with putting urgent ice warnings under paper weights and promptly forgetting them." In the edition of January 18th , T.J. O'Donnell, the General Secretary of the Association of Wireless and Cable Telegraphists came to the defence of the ex-wireless operator, but his complaint is immaterial. O'Donnell provided the testimony relating to the "Californian's" evening message as proof that no other messages arrived on the ship, but he claimed it was Lightoller's testimony but it wasn't - it was Bride's! Lightoller himself replied on January 29th. 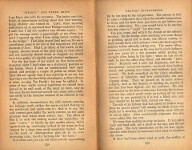 He maintained that had the "Mesaba" message arrived, the Titanic would not have been lost, and in response to Bride's assertion that the message never arrived, Lightoller quoted the relevant section from the final report of the British Inquiry, adding that "I am inclined to think that this statement by Lord Mersey disposes of the accusation that I withheld essential evidence at the inquiry or that the Mesaba message was not received on board the Titanic." Then, providing his own testimony when he called the Mesaba information as of "utmost importance" he then pointed out that other messages failed to reach the bridge, saying "and though not actually reporting ice in our course there seems to be little excuse for its failure to reach responsible hands...Such a message was passed through the Titanic by the German steamer Amerika..." Regarding Bride's defence of Phillips' efficiency, Lightoller shot back by quoting Bride's testimony where he said that he was too busy with accounts to take down the "Californian's" initial message, but got it from a repeat transmission to another station. O'Donnell's complaints were dealt with faster when Lightoller noted that the answers were given by Bride, not him. As noted, this serialisation does not include the part about Bride reading the "Mesaba" message in his bunk. One imagines that Bride would have been incandescent with rage if that had been in the 1936 newspaper version. If Bride had seen the original print run with the accusation, would he have mentioned it in his letter to the paper? Perhaps. Or perhaps it had been excised? The whole situation does show that even after 24 years, Bride's loyalty to Phillips was still strong, even though his memory of the disaster was worse than in 1912! The final warning to the Titanic was sent by the "Californian" at 9.05pm New York Time, or 11.00pm ships time (11.07 on the Titanic). Some 40 minutes before, the "Californian" had come to a stop on the edge of a huge ice field that blocked her progress and also stretched across the Titanic's path. Captain Lord asked Evans if he had been in contact with any ships, and was told about the Titanic. Lord replied that Evans had better advise her that they were stopped and surrounded by ice. Evans returned to his cabin and hearing the Titanic in conversation with the ground station at Cape Race, called him; "MGY MGY MGY MWL Say, old man, we are stopped and surrounded by ice." The Titanic replied, "Shut up, shut up, I am busy; I am working Cape Race" and that he was jamming him. The reply came in with a bang and Evans later said that his own attempt must have done the same. The Titanic resumed with Cape Race, "Sorry, please repeat, jammed" (Evans could not hear Cape Race). Rebuffed, Evans ceased his attempt to warn the White Star ship but noted that the Titanic was still transmitting to shore about 11.25. Five minutes later, he went off duty when he went off duty. Some commentators have said that Evans' message was irrelevant without a position, which could have been of value to the Titanic. Certainly, Evans never spoke of having been given his own ship's position: if he had, and it had been transmitted, it would have been important in the claims that Lord concocted his navigation to try and exonerate his ship. Bride remarked that Phillips, who was on duty at the time, would have made a memorandum of this latest message from the "Californian" if he had persisted in sending it. But Bride glanced at the log while he was writing it up at the time of the disaster and he later said that he could recollect nothing from the "Californian", admitting that he may have overlooked it. He also said that he should have taken it himself to the bridge if he had received it. The rest of the story is known. About ten minutes later, the Titanic struck an iceberg a glancing blow and two hours and forty minutes later, went to the bottom of the North Atlantic taking 1500 souls with her and leaving 700 shivering, shattered passengers and crew in twenty flimsy lifeboats. To be fair to the contentious event of the ignored or missing warnings, all the contradictions and conflicts have been detailed in the preceding essay; necessarily long, possibly tedious, the above is a synthesis of all existing data. But in this author's opinion highlighting the discrepancies is important, as the contradictions tell us more than the congruences. They tell us how the stories evolved, either by innocent, or deliberate omission or distortion of facts. What can be said about the ice warnings? The Titanic received enough to almost certainly warrant a change to her speed and/or course. What can be said about their treatment? On the whole, it was cavalier. The messages did not receive the prominence they deserved. That is if one believes the testimonies, which are riddled with contradictions. Some of the statements hint of evasion, or lies hidden behind the supposed safety of the annoyingly repetitive and vague "I cannot recall" barrier. Of course, some of the faded memories may be innocent; the Officers, like all the survivors had been through a horrendous episode that could have cost them their lives. Detailing every single event that occurred over those five days is an implausible hope. And fortunately, memories could be retrieved; witness Pitman's comments about the two ice warnings and the drifting oil tank steamship, following the detailed questioning of Turnbull. Cogitating on events may also have resulted in better, albeit contradictory stories between the US and British Inquiries a few weeks later. Cynics may also say that coaching by White Star Line officials could also be to blame. But it seems nothing could salvage Bride's erratic memory; it even provoked a sarcastic comment from his interrogators in Britain. On the whole, the general lack of candour by the survivors does nothing to alleviate suspicions that vital information was withheld. Either that, or they demonstrated appalling mental prowess in their recall. The fact that evasion was in play was evident on the first day ashore, with the commencement of the US Inquiry. Lightoller was asked if he knew they were in the vicinity of icebergs. With all we have learned above, Lightoller issued an astonishing "no." He must have been surprised to be asked next about the "Amerika" ice warning - which had been relayed to Washington by his ship, no less! Admitting that he "could not say" if he had heard of it, he then admitted that he had received an ice message (this was from the "Caronia"), and then via torturous, repetitive questioning, he said that they expected to be in ice about 11 o'clock. Aside from this one warning, he claimed that he had no reason to believe that they were in the vicinity of ice. This doesn't jibe at all with his later comments. Bride possibly displayed similar evasions when he was asked, "Did the captain, or any other officer of the Titanic, send any message to the White Star officers respecting the direction, the speed, or the conditions of the weather, the sea, or its proximity to the Great Banks?" The junior wireless operator said, "Communication had been established with the "Baltic" on Sunday afternoon, and compliments were exchanged between the two commanders, and the state of the weather." To his knowledge, nothing else was passed between the two other than the weather. The "Baltic" message was far more important than Bride depicts. But did he know the actual contents? If his testimony is true, he and Phillips never discussed ice. Would Phillips omit the topic of ice in their casual conversations? And if so, why should he? There are suggestions that communication between the officers was lax too. Lightoller said that he was in communication with the Junior Officers, but Pitman at least refuted this. The Captain nor Lightoller (at least between 6 and 8) had talked to him (odd, since he had assisted the 2nd officer taking star sights at 7.30pm). And it was not Pitman's place to talk with the Captain about marks on the chart. Boxhall knew there was information that they were in the vicinity of ice, but neither the 1st nor 2nd officer apprised him of this that final evening. It was never mentioned. In the Marconi Office, Bride and Phillips never talked about the ice warnings. Actually, that is not quite true. The oft repeated "I cannot recall any" was uttered and its use was becoming a tiresome cliche at the inquiries. In summary, very few concrete conclusions can be ascertained on the whole shoddy mess. It must be admitted that during the compilation of the data, a strong opinion was formed by the author that certain facts had been supressed and lies had been told. There is alas a dearth of evidence to support this, but the disappearing and ignored messages and the lack of entries on the navigation chart seem to hint at an almost criminal laxity in the running of the ship. The notion that the Captain would stride by Ismay and hand over the telegram without saying a word or stopping, and then fail to apprise his officers of the data contained therein is, to be blunt, ridiculous. To be colloquial, after the "Caronia's" message, the system on the bridge for reporting and marking ice "went to pot." Incidentally, in 1914, the White Star line was found guilty of negligence with regard to the ship's navigation. At the Limitation of Liability, the White Star settled out of court after much testimony was heard, much of it damaging to the company. It should also be noted that, if the Empress of Britain is any indication, the method of warning other ships was somewhat haphazard. She encountered ice on or about April 9th, but on the 12th she simply sent a message wishing the Titanic good luck. 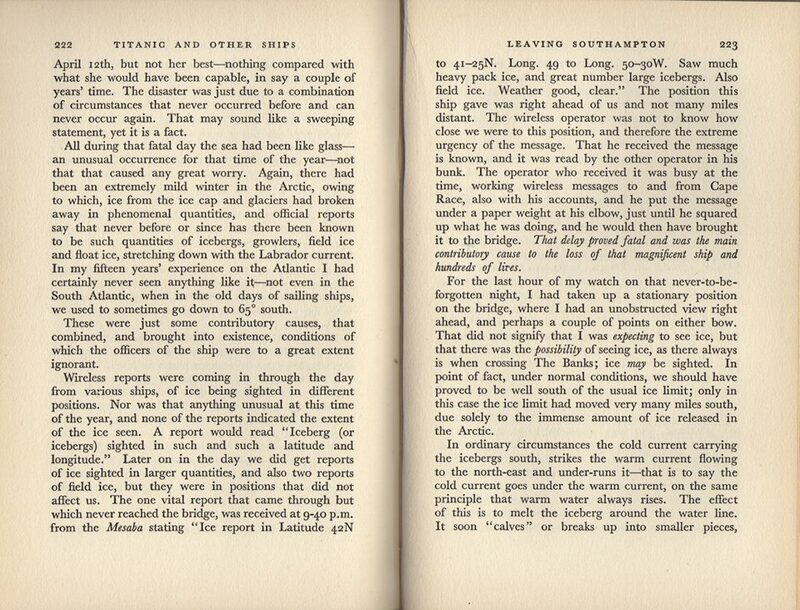 There is no mention of the huge ice field or massive icebergs that the Empress encountered. Probably the message would have been irrelevant anyway as it could have referred to ice well to the north of the Titanic's route and therefore of no concern, but other ships transmitted Marconigrams that were well off route. The Tunisian is another possible example; she sent a cordial message to Captain Smith on April 13th, but neglected to mention that, according to news reports, when she was 887 miles east of St.John's, she entered "a huge icefield, through which she carefully picked her way for twenty-four hours, then stopped all night, eventually turning 62 miles south. No less than 200 icebergs were seen. The commander was on the bridge for a 36 hour spell." Although the actual message that appeared in the nautical literature says it was only a 50 mile detour, the ice was cleared in 43.02 N, 49.30 W; that is, the north of the Titanic's route. Maybe it was considered unimportant being so far away from the Titanic's route? This is an unconvincing argument, as all such warnings should have been regarded as important and could, or should, have been passed to any vessels. Indeed, it the Tunisian's ice sighting was given a southerly set of 1 knot, it would only have taken some 78 hours for it to reach the Titanic's track; the huge field that lay ahead of the liner on the night of April 14th could possibly have been the one sighted by the Tunisian - the longitude is roughly correct, certainly. The lack of cohension in many instances of evidence are suspicious, but beyond that, one cannot say more. Perhaps coincidentally - or perhaps as a way of "passing the buck" the periods of uncertainty (messages disappearing etc.) can almost 100% be placed during the watch of people who could not defend themselves. The voice of cynics may also chorus that the officers had sufficient time on the Carpathia to rehearse their stories, with inevitable conflicts of evidence. That is a sufficiently "easy" conclusion to reach, but the ultimate summary is that we do not know exactly what happened on the bridge and Marconi office of the Titanic. What we do have gives the unpleasant taste not of "a tight ship", but a sloppy, slovenly one lacking in discipline at times and lacking in communication. And that lack of communication probably contributed to the greatest maritime disaster of the period.